Utina, Florida, sounds like one big, sweaty armpit. If nothing else, it appears to be the place you go when your dreams die. For the Bravo family, it’s the place where most everything dies. Frank Bravo, the middle son, would rather stick his toes in a cool mountain lake, but there he is, sweating it out in Utina, working in the family bar. His mother, Arla, lives in the family home with his older sister, Sophia. The two are at constant odds, usually over trivial matters, as Frank attempts to run interference. Thanks to its location, Utina is ripe for development, and soon the Bravos are pursued by a real estate broker wishing to buy their property. Frank resists, as does his mother. Older brother Carson, however, would like to make this deal. Carson has an urgent financial need to make money, and he is not bothered in the slightest by his brother’s reluctance to do so. Frank is a mere annoyance for Carson. The two boys share more than DNA: both love the same woman, with Carson being the one to marry her. Elizabeth soon leaves Carson, moving in with Arla and Sophia, as the potential development deal comes to a head, caused in large part by the return of Dean Bravo, Arla’s estranged husband and the father of her children. While this could be the story of small town USA versus big money developers, it’s really about family and all that it entails. Sure, there is love between the Bravos – even between Frank and Carson. We spend more time in Frank’s head than any other character, and it’s hard not to like him. His intentions are usually honorable, even when Elizabeth is involved. And Carson is a bit of a pig, so it makes it easy to side with Frank. Sophia’s fragility concerns us. Can she be happy? And what about Arla? And what about Dean? Daddy comes home at last? This is a slow, evocative book, one in which the setting is as dominant a character as the humans. Utina feels oppressive with its heat and stickiness. You can’t seem to defeat either, and sweat permeates everything. It makes for a striking symbol, one we can’t avoid considering when we think about the characters. Lest this seem like too much of a Tennessee Williams play, you should know that there is a lot of humor at play here. 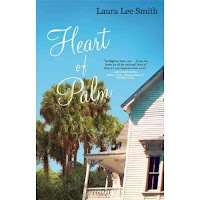 Laura Lee Smith writes with great affection for her characters, and the playful scenes are timed perfectly. Read it, and come back and tell me what you thought, especially about the ending. And tell me if you were impervious to Frank Bravo. I sure wasn’t.